The PDS-1/10G Portable Delay Simulator allows users to test/stage critical network equipment by altering bandwidth, latency, packet loss, congestion and other important link impairments over 10/100/1000 or 10GbE Ethernet. Rockledge, FL, March 06, 2019 --(PR.com)-- East Coast Datacom (ECD), Inc., a leading manufacturer of network emulators, announces the low cost PDS-1/10G Portable Delay Simulator. This easy to use product allows network impairments for bandwidth restriction, latency, jitter, loss and re-ordering at link rates up to 10GbE. The PDS-1/10G allows changes-on-the-fly and has a real-time statistic screen with a packet counter reset. 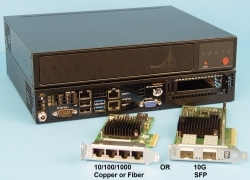 The unit supports 1G or 10G network emulation for one low cost. The PDS-1/10G is immediately available with special promotional offering of $3995.00 US Dollars. Click here to view the list of recent Press Releases from East Coast Datacom, Inc.